Grob-Werke of Mindelheim, Germany has been one of the big machine tool winners of the heavy investment BMW has made to develop its Hams Hall engine plant near Birmingham. Production of new three and four-cylinder engines is now being ramped up on new production lines, and over one million components will be machined at the plant for the first time this year as supply extends to other plants in the Group. The investment project, part of £750 million that has been spent across BMW Group’s UK manufacturing sites, has ensured the Hams Hall site (below) remains a state-of-the-art facility, capable of producing the next generation of engines and securing a long-term future for the plant. Grob-Werke has supplied assembly and machining lines for the plant which has been the scene of much activity for employees of the privately-owned German company which has missed out on a number of important contracts within Ford Motor Company and JaguarLandRover (In the UK, at least, MAG appears to be deeply entrenched at both Ford and JLR with the new Ingenium engine manufacturing plant at Wolverhampton being one of MAG's latest conquests.) The Hams Hall contracts have helped to compensate for any loss of business. Significantly however, Hams Hall is such a status symbol within BMW that this facility will act as a premier benchmark location for Grob-Werke, surely helping it to win further business. Development of the site is a further piece of the jigsaw in BMW Group’s global strategy for engine production. The Hams Hall facility is now operating alongside other plants in Germany and Austria, all producing the same new family of next generation engines. “Our new engine family of highly efficient three, four and six-cylinder engines have a standard design, a high number of similar parts and a uniform process for manufacture,” explains Ilka Horstmeier, who heads up BMW Group’s global production network for engines and electrified powertrain. “This gives us a large amount of flexibility and means we can optimise production between each of our manufacturing locations and respond quickly to changes in customer demand or market developments. The investment in Hams Hall has enabled the plant to grow and play an ever-increasingly important role in the production of these latest engines. 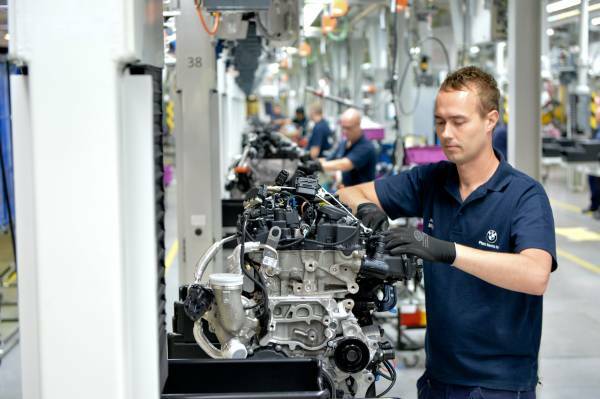 Production of a small number of new engines was first introduced at Hams Hall last year. Three-cylinder BMW TwinPower Turbo technology 1.5-litre petrol engines are hand-built exclusively at Hams Hall on a special production line for the BMW i8, the first purpose-built, plug-in hybrid sports car. This engine has already contributed to a series of award-wins for the revolutionary vehicle as well as two class and an overall win at the International Engine of the Year awards. Overall, the new Efficient Dynamics high-tech engine family includes petrol and diesel engines, all employing TwinPower Turbo technology and ranging from 1.5 to 3 litres. With different power ratings, the engines can be adapted to a variety of vehicle concepts. Commonality across the engines makes it possible to be extremely flexible in achieving significant efficiencies at high production volumes, as well as being able to produce additional special versions of the engines at relatively small volumes across the network of engine plants. Grob-Werke too has invested in over a hundred new apprentices across its four plants worldwide: Mindelheim, Bluffton in the US, São Paulo in Brazil and Dalian in China.